See the horror for yourself when you go Through the Woods! Originally released on Steam in 2016, Through the Woods found its way onto the PSN Store on May 8th, 2018. 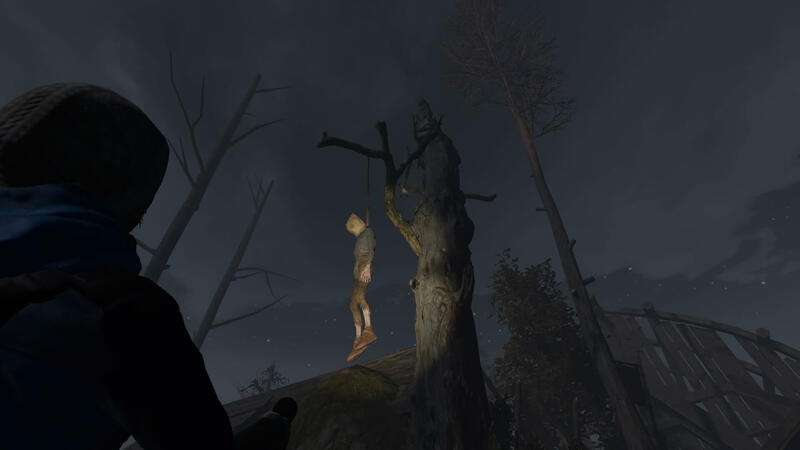 Through the Woods is a third-person horror game set in a lost Norwegian forest filled with mythology, mystery and lore. You play as a woman and mother, Karen, who is looking for her son, Espen. He has been kidnapped by the legendary man, ‘Old Erick’. Karen must now follow their trail and discover the mystery behind Espen’s kidnapping. What is his plan? What fate awaits Espen? What awaits Karen inside the woods? 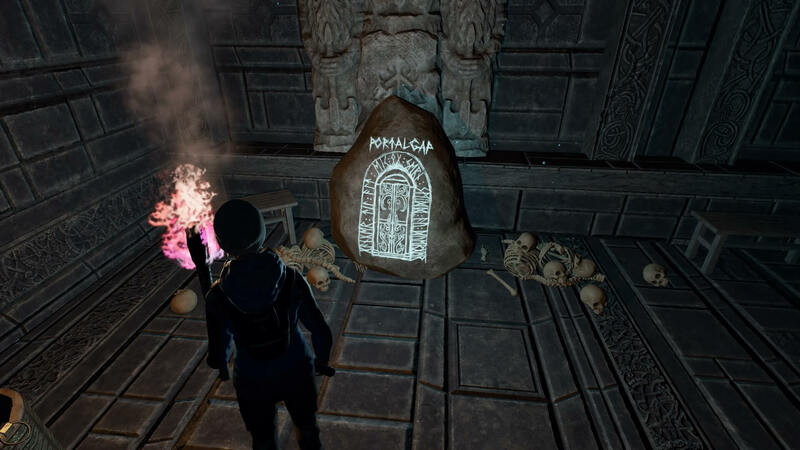 There are many mysteries on the island that you’ll discover as you explore. One of the many strengths of Through the Woods is its ability to keep you entranced in the story during even the slowest parts. From text found in notes and journals to the character narrating her thoughts to you as you play, the story is what drives this games. The psychological horror of the narrative really shines through in these areas, giving the player more to think and stress about things than sneaking by and running from a few monsters. The graphics are also great, and often add to the setting’s overall eeriness. A village on fire. The broken moon in the sky. The forest inhabited by fearsome creatures of mythology and lore. All of these are accentuated by a beautifully crafted environment that draws you into the world and keeps you moving forward, wanting more. The biggest flaw of the Through the Woods, and the only one I feel is worth noting, is its pacing. 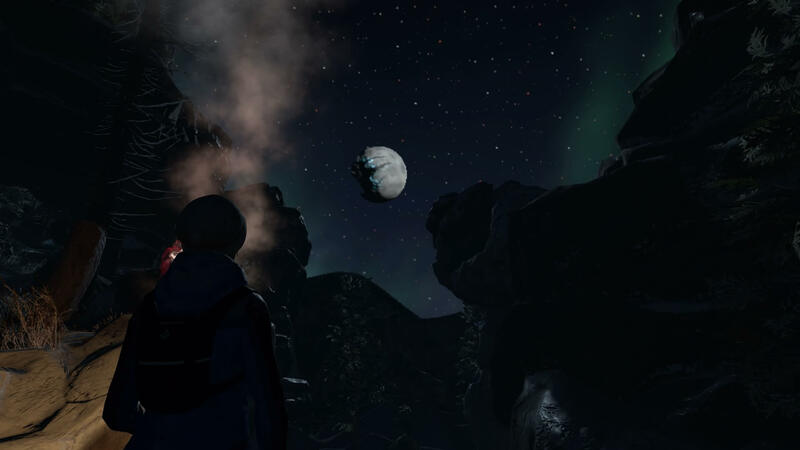 The broken moon in the sky adds to the games eerie tone as you make your way… through the woods. As I stated above, there are slow parts in the game where you’re more or less walking from one end of an area to another with nothing in between. Sure, there are things to explore and see, but not enough to warrant such long stretches of nothingness. I understand the concept of space in a game and story, however, that space isn’t being used to its utmost here, which is unfortunate given its well-written story. This is a common pitfall of many horror games, though. So it’s not a game killer, and definitely shouldn’t scare you away from the Through the Woods experience. Given that the game has been out for some time, I don’t think they could have done much different than they did with the port. Through the Woods’ user interface is excellent and translates well to the PS4. However, as with most ports, they missed the opportunity to add to the game — console-exclusive content or even adding to the story for more play time. This, of course, doesn’t take away from the game either, and Through the Woods is an excellent example of a console port done well. This was probably one of my favorite areas in the game. The destruction and hopelessness of the area was felt by Karen and myself. Overall, Through the Woods is an experience that shouldn’t be missed if you’re a horror fan or a fan of Norse mythology. I loved the setting, the lore and the story and my time playing the game was well spent. I highly recommend this game to anyone with interest in the above categories. You can pick up a copy of Through the Woods on Steam for $19.99 or on the PSN Store for the same price. Enjoy horror games? Check out our list of great free Horror games that you can play right now. David T. Bosquez is a writer, game designer and developer, U.S. Army Veteran, father, and husband. He is also an avid gamer of various genres and formats, of both tabletop and video games. He currently lives in London, KY with his wife and three children.